This property is a 2 minutes walk from a lovely old village square, which has a good selection of tavernas and restaurants and 2 small shops. There are many beaches all within easy reach. you can travel by bus or taxi. Tala is also an ideal base for one of the 3 championship golf courses of Cyprus, Tsada, approximately an 8km drive. Paphos is also a short distance away, this thriving town has everything to offer, shops, restaurants, a harbour with castle and a vibrant nightlife. Coral bay is closer, with a great choice of restaurants and beaches. You will also find many historical sites to visit, as just about every major civilization has invaded at one time or another over the past few thousand years. We spent a lot of time locating this best spot in Cyprus, just off the main drag and above the humidity line with great views. This is our overseas home on a beautiful site where several expats now reside. They are friendly and helpful, but to keep it that way I try to impress guests this is not a holiday park, and by attracting sensible adults and family's a good environment and atmosphere is maintained for the locals. So far everyone has enjoyed their stay. 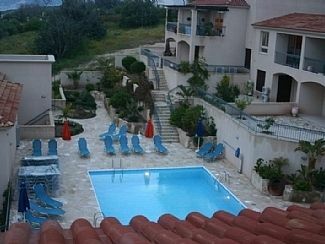 Perfect location, near to all aspects of Cyprus life but private and quiet. Swim every day just a few feet away or drive down to the beach. Eat out locally (and drink) or barbecue at home. Family bathroom and wc, with shower over bath (downstairs). Separate wc cloakroom upstairs. Towels, robes, hair dryer etc. Large living room with separate dining area, open plan, with satellite TV and DVD. Large balcony with table and chairs, access from living room with good sea views of the west coast (Coral Bay). Fully equipped open plan kitchen and dining area you will find a hob and oven, microwave, fridge/freezer, kettle, toaster, coffee maker. Also washing machine, clothes drier, iron and ironing board, cutlery, crockery, glassware, cooking utensils. Skiing is available in the nearby Troodos mountains, but check conditions before booking. Tala is also an ideal base for one of the 3 championship golf courses of Cyprus, Tsada, which is approximately an 8km drive. Notes on accommodation: Several UK owners are in permanent residence, or on holiday, For more information, pictures and availability or online booking, please use enquiry button or go to http://www.cyprusxyz.co.uk/ . Outside: The house is in a very quiet area. It includes the shared, very large swimming pool, a south facing garden, a south facing patio area, a south facing balcony with sea views (sun downers) panoramic views, a barbecue. If you are driving there is a garage with the outside areas of the house having external lighting. The pool has plenty of sun beds and is positioned beyond our car park, this cancels out any noise from the swimmers. Utility Room: Vacuum cleaner, brooms, mops, bucket and cleaning materials. spare room heater. Cleaning / Towels / Linen / Maid service: Small welcome pack with wine, milk, bread, fruit. The cleaners live close by and will charge 65 euro for pick up and return inclusive. (recommended as taxi's have trouble with directions) Other: For more information, pictures and availability or booking go to http://www. 10 minute drive to Coral Bay and other beaches. Approximately less then 20 minutes drive away you will find beaches, sailing, water skiing, boat hire, wind surfing, fishing, cycling, mountain biking, horse riding, golf, tennis, scuba diving, historic sites, museums, shopping areas, a theme park, restaurants, food shops and supermarkets. Less then 45 minutes drive away you will find climbing, go carting, water parks, several historic sites. The house is 20 min from Pafos airport. 15 min from Tsada golf course. 15 min from Pafos harbour. 10 min from Coral Bay. Booking Notes: Changeover Day: Flexible days and all hours.